A massive amount of new office space is coming to Vancouver’s False Creek Flats area beginning with a development by PCI Developments and Low Tide Properties. 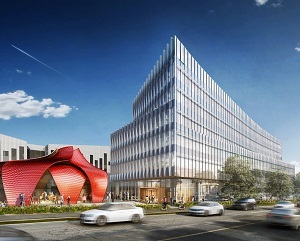 Launching this spring is a seven-storey, 160,000-square-foot class-A structure at 565 Great Northern Way which is designed for the emerging digital media and creative sector. It is already 72 per cent pre-leased. The new development comes at a time when Vancouver’s downtown vacancy rate is the second-lowest in North America, with very limited new supply on the horizon. Finning International, the world’s largest dealer of Caterpillar equipment, is moving its global headquarters from three separate locations back to False Creek Flats, occupying 29,000 square feet in the new building. Blackbird Interactive Game Studio will be leasing 29,000 square feet, with Spaces, a co-working space, leasing 39,000, and Samsung leasing 20,000. Officials say more tenants will be announced soon. It’s the first multi-tenant office building in the area in 18 years, and the first of more than 1.9 million square feet planned in the neighbourhood by the developers. Blair Quinn, executive vice-president at CBRE Canada, said Vancouver’s office vacancy rate of five per cent is the lowest since 2013. “This adds significant supply to an emerging neighbourhood that has been endorsed by the global and local creative and tech companies, including the first tenants into this new building,” said Quinn. “Finning’s move highlights yet another massive change to the area. It’s not just tech and creative companies moving in, but more traditional companies like Finning that are changing their business model in order to evolve, hire and retain talent. Tim Grant, VP of PCI Developments, said the goal is to attract a mix of tech-savvy companies to its flagship building. The four anchor tenants bring together a unique mix of international and local companies, he added. The developers are branding the site of the new office space as South Flatz. “It’s the first building in a number that are coming,” said Grant. Five more buildings are being planned for construction or redevelopment — one is an older building that is being renovated. One building will be constructed within three to four years. The renovated building will see improvements take place over the next year. Three other buildings will depend on the completion of a new rail transit line in the neighbourhood, but are slated for construction over the next six or seven years. “First and foremost, that Mount Pleasant area in Vancouver (nearby) has really taken off in the last couple of years, particularly for companies with a tech or creative industry perspective,” said Grant. “Some of the space has got kind of an industrial feel to it. For a lot of creative and digital type workers, it’s been a real popular area. “As Main Street has continued to evolve, and moving east of Main Street, we felt there were large sites that you could have larger floor plates that were well-suited to some of the bigger tech companies that maybe wanted to be on one floor and in an open-concept type office. Grant said the developer is also very focused on transit-oriented development. The prospect of a future station in the area made the site attractive as well. Finning has been headquartered in Vancouver since its founding in 1933. The head office move to False Creek Flats is like coming home, as its roots on the site go back to 1964. For many years, the company was the largest landholder along Great Northern Way. However, in 2001 it donated 7.3 hectares of industrial lands and historic warehouses to the University of British Columbia, Simon Fraser University, British Columbia Institute of Technology and Emily Carr University of Art + Design. The area became a hub for creative tech companies and digital media. Cummings said the actual move will take place from July to September. The company currently has three locations – the corporate headquarters in the downtown core; the Canadian operations support team in Burnaby; and Finning Digital, a new business it started 18 months ago in Gastown. He said the move will reduce the company’s real estate costs, but more important is the cultural aspect. The move will bring together different groups of people and styles. “This is much more of a cultural exercise than a financial one from my perspective, though there are financial benefits. The real objective is to bring the digital team and the corporate team and the operations team closer together, because there’s a huge amount of collaboration from those groups being blended under one roof,” added Cummings. The new building will be seeking LEED Gold certification and will include a large rooftop deck with panoramic views of the downtown and the North Shore Mountains. It will also have a fitness centre, a distinctive 2,000-square-foot retail pavilion with food and services for the neighbourhood and a 20,000-square-foot public plaza. “With nearby Mount Pleasant now a mature area with limited supply,” said Quinn, “False Creek Flats is poised to become a major player in the city’s tech ecosystem with the addition of this new supply.